What is a BI tool? According to Investopedia, business intelligence (BI) is “the procedural and technical infrastructure that collects, stores and analyzes the data produced by a company’s activities. Business intelligence is meant to take in all the data generated by a business and present easy-to-digest performance measures and trends that will inform management decisions.” Essentially, it is the act of making data-driven decisions based on data analysis and data visualization in order to better a business’s strategy and success. While you might think this is simply common sense because once you have your analysis, wouldn’t you easily make better decisions? Not exactly. Business intelligence isn’t as easy as it sounds because there are a lot of tools, processes, and factors involved that allow you to go from A to B where your data analytics become data-driven decisions. What is the difference between a dashboard and a BI tool? While dashboards are extremely relevant and useful to hoteliers, they lack the extra step that business intelligence tools offer. As a decision maker in any industry, analytics dashboards are essential to seeing how your business is performing, trends occurring in your performance, and other valuable facts produced from your data. BI tools, however, allow human beings to make more accurate decisions based on the data analysis to reduce costs, increase profits, and all in all, improve the business. While we as hoteliers are hired to make these decisions based on our knowledge and experiences, BI tools simply enhance our thought processes by guiding us to the right answers and facts that we might not have seen by glancing at our data dashboards. Instead of manually sorting through the data from a hotel’s PMS, POS, revenue management tools, reservation systems, etc., BI tools help speed up the manual work and automate the decision making efforts that would have taken hoteliers more time and effort to produce. 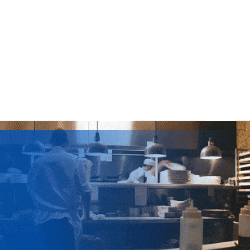 There are many BI platforms available to the hospitality industry with the objective of assisting your hotel with business intelligence decisions, however they differ by specialization. Some BI tools target independent hotels or enterprise groups, a few tools offer customizable features and niche products, while others are more specialized to certain processes like revenue management or F&B related decisions. Like any decision or purchase made, it’s important to know what you’re looking for and what exactly a new product entails. When it comes to technology, there are so many variations of a specific tool, that it’s crucial to have a basic understanding of what features are important to your hotel. 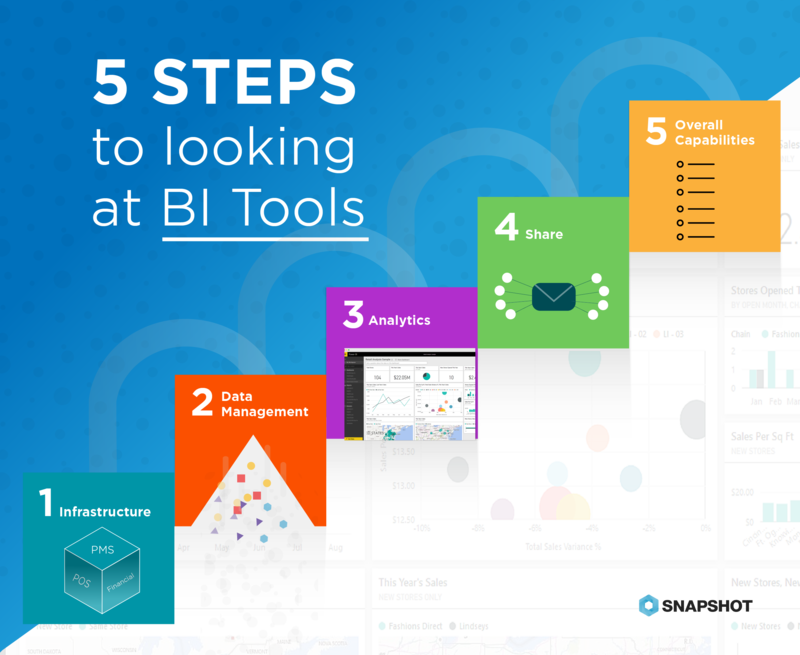 There are five main points to look for when purchasing a BI tool: infrastructure, data management, analysis and content creation, sharing of findings, and overall platform capabilities. Data management is the key criteria to consider when selecting a BI tool because it will be handling the biggest part of the work. A BI tool must be able to manage metadata, load and store data, prepare data to be customized, and handle huge volumes of data that a hotel company will be producing, efficiently and effectively. With smooth data management, then a BI tool must know how to analyze the data and place it into an advanced, interactive, and visual dashboard. With this detailed dashboard, a BI tool needs to find a way to summarize findings and integrate them into various platforms like mobile devices as they become more and more necessary to the industry. As the hotel industry becomes more diverse and unique to individual companies, APIs and open platforms are becoming integral to hotel technology. A BI tool needs to not only have these capabilities, but also allow for sharing and extraction of the data analysis. Last, but not least, BI tools must also be easy to use and visually appealing, as they allow all of the other factors to come together and decision makers to use the technology seamlessly. 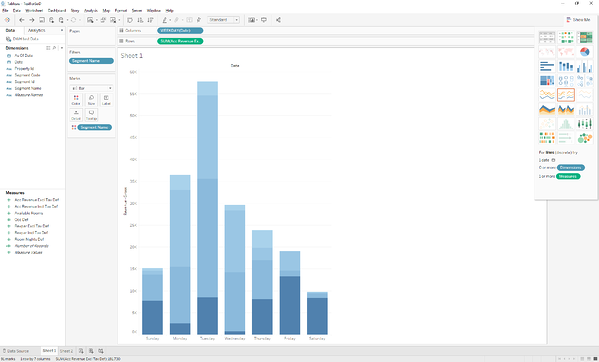 What are the pros and cons of Tableau, PowerBI, Juyo Analytics, SnapShot Analytics, etc.? Once a beneficial technology like business intelligence has proven its worth, it comes to no surprise that many companies would try to get a piece of the business and build the best tool. With BI tools, this has been the case as there are numerous versions of the technology available today. While some are used across industries and more broadly, there are also a handful of hospitality specific tools. According to Capterra, the biggest and most well-known BI tools across industries are Tableau, Qlik, SAP Business Objects, IBM Cognos, and Microsoft Power BI. Within the hotel industry BI tools are currently mainly used in Revenue Management, but this will eventually grow to hotel operations and more. Hotel Tech Report lists several tools in the Revenue Management category. We've selected some niche BI tools dedicated to improving your hotel business like Juyo Analytics, Hotel IQ, In Touch Data, Hotelistat, Datavision, and SnapShot Analytics. When selecting a BI tool, a hotel must consider the size of its business, the cost of the tool, the integrations available with the tool, and the end user of the technology. For instance, Power BI is more suited for a bigger stakeholder of a smaller business with a lower budget. Whereas Tableau would benefit an enterprise company with more resources and capital. Hotel specific BI tools are varied based on geographic coverage, target groups, and integration partners. Depending on whether or not they are independent platforms or sub-products of a larger technology company, the tools can have different offerings. Products like Datavision and SnapShot Analytics provide data dashboards with single and multi-property overviews, forecasting and budgeting tools, multi-property data analysis, and occupancy, RevPAR, and pick-up rate analysis. It would be impossible to count the number of decisions that are made on a daily basis in a hotel from the executive level to front office that will impact the hotel in one way or another. Needless to say, there’s a lot going on within a hotel and time is of the essence. 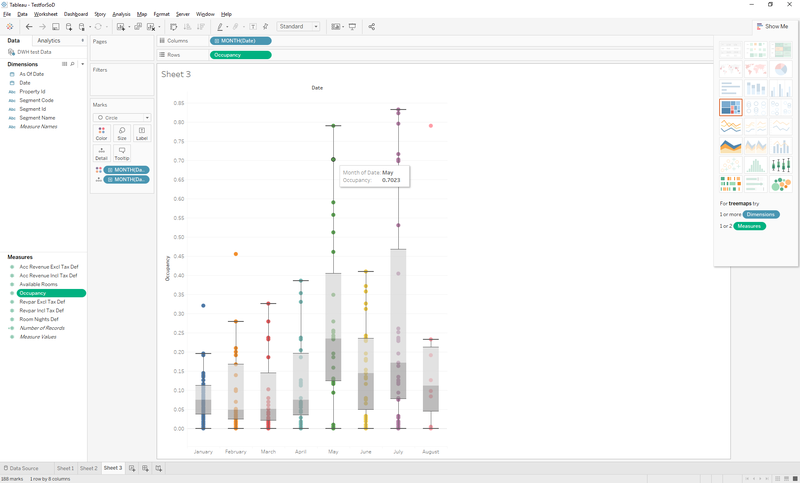 Before BI tools, in order to have your data presented in easy-to-read graphs, you would have to pull your data into Excel to build any type of diagram, graph, chart, etc. Only after you sorted through all of the data and skillfully reorganized it to allow these presentation tools to be created, could you find your data in a semi legible manner. Now with BI tools, hotels can take their data from a PMS, digest it with analytics tools, and easily have data visualization within a matter of seconds. However, the last step that needs to take place how to make decisions based on analyzed and visualized data. Hotels can then store harmonized data from different data sources and connect it with any BI tools, which allows hospitality organizations to be build graphs with one click depending on PMS data points. With BI tools, this can also be done quickly thanks to the graphics and easy-to-use features of a BI platform. Thus, data platforms using BI tools can help hospitality businesses create customized visuals, combining different data sources without having to ask their IT specialists or data scientists to build thousands of customized queries, which have to be accumulated in Excel or SQL database. For hotels in particular, BI tools have many benefits specific to the industry. For instance, hotels deal with huge amounts of inventory on a daily basis and BI tools are incredibly useful when tracking costs, monitoring supplies, and reducing spending in departments where inventory can be cut. BI tools can also act as add-ons to a hotel’s CRM program as not only can you track a guest’s booking history and spendings, but you can also use BI to customize a guest’s stay further by building guest profiles, detailing their preferences, needs, and interests. Additionally, as in most industries, marketing is a huge factor in the success of a hotel’s business. BI tools allow marketing campaigns for hotels to be even more targeted to specific audiences as it helps track success rates of previous campaigns. Not only do BI tools help hotel managers make decisions, but they also cut costs, increase customer loyalty, and enhance marketing tactics. Who should be using the tool daily? Anyone who makes a decision in a hotel can benefit from a BI tool. Owners, revenue managers, marketing managers, F&B managers, general managers, sales managers, etc. As data lies in all aspects of a hotel, most divisions can benefit from using a BI tool to help with their decision making process. On the other hand, operational employees may not need to use BI tools, but instead, carry out the decisions made from a manager using the BI technology. So, in the end, BI tools do affect most parts of a hotel, directly and indirectly. So it’s pretty clear to see that BI tools are great for any business, but for hospitality, they seem to be extra helpful. Unfortunately, within the industry, many systems used by hospitality companies cannot directly connect to any BI platforms like a few PMS offerings. So, if you’re a hotel using a PMS without the ability to connect, you’re out of luck. Or are you? BI connectors essentially remove all manual work that hotels would need to do if they were to connect their PMS directly with a BI tool. For instance, within Power BI, it is impossible to select a data range on how KPIs are calculated and hotels then are forced to manually adjust their settings and data. Another downside to directly connecting a PMS to a BI tool is that it can be quite time consuming without the BI connector as a middle-man. When there are multiple properties that have different PMS systems or properties that have slightly different settings or naming conventions this can become problematic for BI tools. Not only is there the need for more personnel to perform the manual work, which can lead to inconsistent updates that are very time consuming due to the number of reports that need to be pulled and sorted through (harmonized), a BI tool can also prove to be quite time consuming. Additional functionalities, integrations, and development on the PMS side can add on many costs that are much higher than simply using an add-on BI connector. 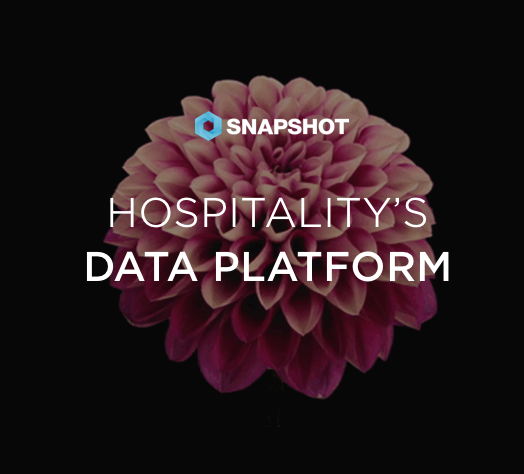 What Is a Data Platform and How Does It Work in Hospitality? Which hotel APIs should I be asking vendors about for my hotel?